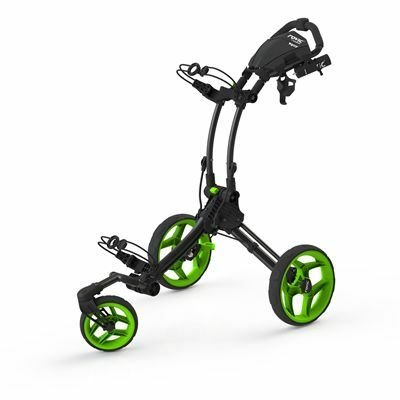 The Clicgear Rovic RV1S swivel golf trolley provides easy manoeuvrability and practicality thanks to its rotating 360 degree swivel front wheel. The swivel wheel can also be locked and there is a great quick push button folding system for simple storage. The golf trolley has a multi-feature console, built-in storage space for accessories, an umbrella holder and a hand brake for safety. The trolley is low weight thanks to its lightweight aluminium frame and has a soft grip handle for comfortable use. for submitting product information about Clicgear Rovic RV1S Swivel Golf Trolley We aim to answer all questions within 2-3 days. for submitting product information about Clicgear Rovic RV1S Swivel Golf Trolley. We aim to answer all questions within 2-3 days. If you provided your name and email address, we will email you as soon as the answer is published. for submitting product review about Clicgear Rovic RV1S Swivel Golf Trolley.